The Volgistics online volunteer tracking and coordinating service ("Service"), owned and operated by Volgistics, Inc. ("Volgistics"), is provided to the organization or entity registered in this process, its authorized users, and the owner of the account used for registration purposes (collectively, the "Customer") under the terms of this agreement and any operating rules or policies (collectively, the "Agreement"). If Customer is using this site on behalf of an organization or other entity, Customer confirms that it has the legal authority to enter into this agreement on behalf of such organization or other entity. REGISTRATION FOR THIS SERVICE REQUIRES (a) ACCEPTANCE OF THE TERMS CONTAINED IN THIS AGREEMENT; (b) THAT CUSTOMER IS AT LEAST EIGHTEEN (18) YEARS OF AGE. BY COMPLETING THE REGISTRATION PROCESS AND CLICKING THE "I ACCEPT" BUTTON, YOU AGREE TO BE BOUND BY THIS AGREEMENT. PLEASE READ THIS AGREEMENT CAREFULLY BEFORE CLICKING THE "I ACCEPT" BUTTON. IF YOU DO NOT AGREE WITH THESE TERMS, YOU SHOULD CANCEL THE REGISTRATION. Volgistics reserves the right to change the following terms, or the policies incorporated in it by reference, or to add additional terms or policies at any time, and such changes or additions shall become effective ten (10) days after they are posted. Volgistics posts notices in advance of such changes on the Welcome screen you view when you access your account. The Customer is advised to review these terms and the incorporated policies periodically. 2.1 Data stored within the Volgistics system by the Customer is the sole property of the Customer. Title and ownership of the volunteer data entered by the Customer remains with the Customer. No transfer of ownership shall occur under this Agreement. 2.2 Volgistics either owns or has licensed the rights to the software, content, graphics, online documentation, reports formats, and demonstration records, including modifications, updates, revisions or enhancements thereto, located on this web site (the "Site") and offered through the Service. 3.1 Use. The Customer (including all users authorized by the Customer) is hereby granted a non-exclusive, non-transferable license to use the Service in accordance with the terms of this Agreement and the instructions on the Site for the single company or entity defined in this registration process. 3.2 Restrictions. Customer's use of the Service is subject to the following restrictions. Customer shall not, and shall not permit others to, (a) modify, copy, or otherwise reproduce the Service in whole or in part; (b) reverse engineer, recompile, disassemble, or otherwise attempt to derive the source code form or structure of the software used in the Service; (c) sublicense, assign, share, timeshare, sell, rent, or otherwise convey in any manner the Service to others; (d) remove any proprietary notices or labels displayed on the Site; and (e) use the Service or Site for any unlawful purpose. All rights not expressly granted to Customer are reserved by Volgistics. There are no implied rights. 3.3 Stored Information. Customer is solely responsible for the content of any information or data stored in Volgistics ("Stored Information"). Customer warrants that the Stored Information will not contain content that is libelous, obscene, scandalous or defamatory, and that the Stored Information will not contain content that violates the personal, proprietary, or intellectual property rights of any third party. 3.4 Email/SMS. Customer agrees not to use Volgistics for the purpose of sending unsolicited bulk email or SMS messages, or that promotes any commercial activity unrelated to the mission of the Customer's organization. Unsolicited bulk-email and SMS messaging is defined as messages sent to multiple individuals who have not previously established a relationship with the Customer (for example, through the submission of an application or registration form, request for additional information, or a business association) or who have asked to be removed from the Customer's email list or opted out of receiving SMS messages. 4.1 Service suitability. Volgistics provides a variety of freely available tools to help Customer understand Service features and capabilities, including a free trial and sample accounts. The Customer will use these tools to determine that the Service suits their needs before paying for the service. Customer acknowledges these tools, and their responsibility for using them to determine that the Service works in a way which will suit their needs. 4.2 New features or modification of existing features. While Volgistics may periodically make, announce, or document proposed enhancements to the Service, Customer agrees that the Service may include only the features available at the time they sign-up. Customer also acknowledges that, if the Service is enhanced, there may be changes in the way existing features work. When major changes are made, Volgistics alerts Customers by posting a description of the change before implementation. 5.1 Volgistics fees. The Customer is completely responsible for all charges, fees and taxes (including but not limited to sales and use taxes) arising out of use of the Service. Volgistics reserves the right to change fees or institute new fees at any time, and such changes or new fees shall become effective as defined in the Payment Terms. Changes in fees or new fees shall be posted on this site in advance of their effective date. 5.2 Billing. Customer agrees to the Payment Terms posted on the Site at https://www.volgistics.com/ex/help.dll?act=21&topic=2303. Customers pay for the Volgistics service online by credit card, by check or by electronic transfer. Customers may review their accounts at any time the Service is available. Customers may cancel the Service at any time, as described below. Volgistics has the right to suspend use of the Service in cases where service fees have not been paid by Customer until such time as the service fee is paid. 5.3 Identification. For the purpose of identification and billing, Customer agrees to provide Volgistics with and maintain accurate Customer information, including, without limitation, Customer legal name, address, email address; and credit card or bank account information. Failure to maintain this information may, at Volgistics' option, result in suspension or termination of Customer's right to use the Service. 5.4 Third party fees and costs. In addition to the charges set forth above, Customer is responsible for all expenses and charges associated with accessing the Internet and connecting to the Service, any service fees associated with such access and connection, and for providing all equipment necessary for Customer to make the connection. 5.5 Cancellation. Customer may cancel this Agreement and use of the Service at any time using the 'Cancel' option under Account management in the Setup area. Thereafter, Volgistics will cease billing the Customer's credit card for the monthly service fee if the Customer paid through Automatic Monthly Billing. There is no refund of any fees that the Customer may have already paid, or credit balances from credits previously issued. If Customer wishes to obtain its volunteer data, the Customer is responsible for retrieving their volunteer data from the Site prior to their cancellation. Customer grants Volgistics the right to destroy information left in cancelled accounts. Volgistics will remove Customer data from the Site after 30 days of Customer cancellation. 5.6 Lack of payment. If Customer allows its account to be automatically cancelled due to lack of payment, their account will first be put on a Hold status for 30 days beyond the Paid Through date and will be deleted 30 days after the Hold period expires. Trial accounts are deleted from the system 60 days after the trial account expires. 5.7 Extended inactivity. If an account is setup for automatic monthly payments and has no activity for a 10 month period, we will discontinue billing the credit card on file as a courtesy. The account will be put on hold for up to 30 days while we email notices to the billing contact and account Administrators for further instruction. If we do not receive a response from the account holders within 30 days of the end of the 30 day hold period, the account will be cancelled and the Customer data will be removed from the system without further notification to the Customer. 6.2 Security. Volgistics uses commercially reasonable practices, including encryption and firewalls, to ensure that Customer information is disclosed only to Customer authorized users. These practices are more fully explained at https://www.volgistics.com/security.htm. However, Customer acknowledges that the Internet is an open system and Volgistics cannot and does not warrant or guarantee that third parties cannot or will not intercept or modify Customer data. 6.3 Credentials. Access to Customer data is protected by a three part credential system (account number, login name, and password). Customer selects their own login names and passwords, and issues credentials to the individuals they authorize to use the Service. The Customer is responsible for maintaining the confidentiality of these credentials, and agrees that Volgistics has no obligations with regard to the use of such credentials by third parties. The Customer is responsible for any and all activities in the Customer's account. The Customer agrees to notify Volgistics immediately if Customer has any reason to believe that the security of the Customer's account has been compromised. 6.4 Forgotten credentials. To retrieve forgotten passwords, Customers must provide the account number and the e-mail address associated with the forgotten password. Forgotten passwords are sent only to the Customer email address associated with the password. For Customer protection, assistance with the recovery of any other lost or forgotten account credentials (account numbers or login names) is strictly controlled, available only after positive identification of the account holder has been established by Volgistics. 7.1 Availability. Volgistics uses commercially reasonable efforts to maintain availability of the Service twenty-four (24) hours per day, seven (7) days per week. These efforts are more fully described at https://www.volgistics.com/reliability.htm. However, scheduled and unscheduled interruptions may occur, and Volgistics does not warrant or guarantee totally uninterrupted availability of the Service. Scheduled maintenance is normally conducted during nights or weekends, to cause minimum inconvenience to Customers. Notifications of such interruptions are posted in advance. In the event that an unscheduled interruption occurs, Volgistics will apply appropriate resources to resolve the problem and return the Service to availability as soon as possible. During these scheduled and unscheduled interruptions, the Customer may be unable to use the Service. 7.2 Reliability. Volgistics uses commercially reasonable practices, including redundancy, fail-over and backup practices, to provide the Service with no unplanned interruptions of service and no loss of Customer data, as more fully described at http://www.volgistics.com/reliability.htm. However Volgistics does not warrant or guarantee that such events will not occur. Volgistics' sole and exclusive obligation for any loss or damage to the Service or data is to use reasonable efforts to provide Customer with the most recent available backup of the Service or data. 8.1 Methods. Volgistics provides support to Customers through online documentation and support. To obtain online support, Customers post and receive messages in their Volgistics Mailbox. The Service does not include technical support by phone. 8.2 Scope. Volgistics can assist Customers with questions related to their account, billing, costs, service availability, questions related to the use of Service features, and assistance related to the resolution of Service conditions that would prevent it from functioning in accordance with its specifications. Support for Internet connectivity, external software such as web browsers, word processors, spread sheets, and PDF readers, including the use of printers with such programs, are outside the scope of Volgistics support services. Organizations that use the optional VicNet and VicTouch modules are responsible for answering questions that their volunteers may have about how to access and use these modules. Volgistics does not limit the number of support inquiries a Customer may make, however it may answer inquiries by referring the Customer to the location in the online documentation where the answer to an inquiry is located. 8.3 Timeliness. Volgistics strives to respond to all inquiries right away. Some technical inquiries and questions for the business office may take longer. Our support team is available to answer your questions weekdays from 8am to 9pm Eastern. On Saturday, we are available from 11am to 4pm Eastern. Additionally, a support team member(s) will log in at least once Saturday evening and three times throughout the day on Sunday. 9.1 Warranty. Volgistics warrants that the Service functions in accordance with the specifications described on the Site. 9.2 DISCLAIMER OF ALL OTHER WARRANTIES. EXCEPT AS EXPRESSLY PROVIDED HEREIN, VOLGISTICS HEREBY EXCLUDES ALL WARRANTIES, WHETHER EXPRESS OR IMPLIED BY OPERATION OF LAW, COURSE OF DEALING, TRADE USAGE, REPRESENTATION STATEMENT OR OTHERWISE, INCLUDING BUT NOT LIMITED TO ANY IMPLIED WARRANTY OF MERCHANTABILITY OR FITNESS FOR A PARTICULAR PURPOSE. IN NO EVENT SHALL VOLGISTICS BE LIABLE TO CUSTOMER FOR ANY SPECIAL, INDIRECT, CONSEQUENTIAL, OR INCIDENTAL DAMAGE, HOWEVER CAUSED AND ON ANY THEORY OF LIABILITY ARISING IN ANY WAY OUT OF THIS AGREEMENT, EVEN IF NOTIFIED OF THE POSSIBILITY OF SUCH DAMAGE. VOLGISTICS' AGGREGATE LIABILITY TO THE CUSTOMER FOR DAMAGES UNDER THIS AGREEMENT, REGARDLESS OF THE FORM OF THE ACTION AND WHETHER IN CONTRACT OR IN TORT, INCLUDING NEGLIGENCE, SHALL BE LIMITED TO THE AMOUNT OF FEES PAID BY THE CUSTOMER TO VOLGISTICS FOR THE SERVICE DURING THE PRIOR TWELVE (12) MONTHS. 10.1 Termination. Volgistics reserves the right to restrict, suspend or terminate Customer access to the Service in whole or part without notice and without liability, in the event of any Customer breach or threatened breach of this Agreement. In addition, Volgistics may terminate this Agreement, for any reason or for no reason, with thirty (30) days notice to Customer. 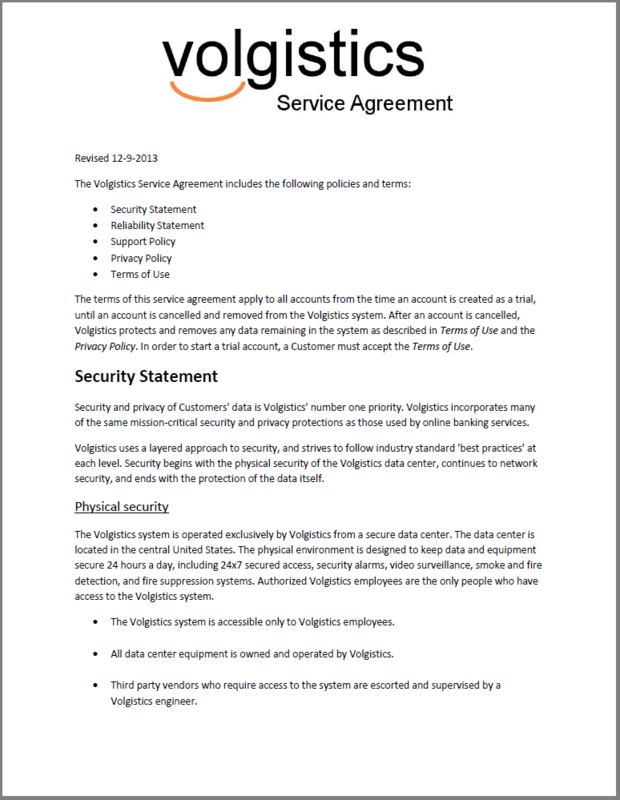 If this Agreement is terminated by Volgistics for reasons other than Customer breach, Customer volunteer data will be made available by Volgistics for Customer downloading for up to ninety (90) days after termination. After ninety (90) days Volgistics shall destroy remaining data in Customer's account. 10.2 Governing Law and venue. The terms and conditions of this Agreement shall be governed, construed, interpreted, and enforced in accordance with the domestic laws of the State of Michigan, without giving effect to any choice of law or conflict of law provision or rule (whether of the State of Michigan or any other jurisdiction) that would cause the application of the laws of any jurisdiction other than the State of Michigan. Any and all actions concerning any dispute arising under this Agreement shall be filed and maintained in a court of Kent County, Michigan or the federal district court for the Western District of Michigan, and in no other court. The parties irrevocably consent and submit to the jurisdiction and venue of such state or federal court and waive, to the fullest extent permitted, the defense of an inconvenient forum. 10.3 Headings; Construction. Headings in this Agreement are for reference purposes only and shall not affect the interpretation or meaning of this Agreement. No provision of this Agreement or any related document shall be interpreted or construed for or against any party because such party (or such party's attorney) actually or purportedly prepared or requested such provision, any other provision, or the Agreement as a whole. 10.4 Severability; Survival. If any provision of this Agreement is held by court of competent jurisdiction to be contrary to law, then the remaining provisions of this Agreement will remain in full force and effect. The payment obligations contained in article 5, the provisions of Paragraph 9.2, and the provisions of Paragraphs 10.2 through 10.6 shall survive the expiration, cancellation or other termination of this Agreement for any reason. 10.5 Attorneys' Fees and Costs. In the event of a breach of this agreement or any other breach by Customer or its employees, agents, or representatives, Volgistics shall be entitled to recover costs and attorneys' fees incurred. No other parties shall be entitled to collect attorney fees or costs associated with any legal action related to this Agreement or the Service. 10.6 Force Majeure. Notwithstanding any provision contained in this Agreement, Volgistics shall not be liable to the extent performance of any terms or provisions of this Agreement is delayed or prevented by civil disorders; wars; acts of enemies; strikes; lack of available resources from persons other than parties to this Agreement; labor disputes; electrical equipment or availability failure; fires; floods; acts of God; or federal, state or municipal action, statute, ordinance or regulation.